At a scarcely believable 20 minutes from the downtown of a major metropolitan city, Vancouver’s Grouse Mountain is the ultimate in snowboarding convenience. Whilst not the biggest or best ski resort around in terms of the number of trails or lifts, you simply can’t beat it for sheer ease. Whilst claiming to be 15 minutes from Downtown on their website google maps decided it was 20 minutes with no traffic so the 15 minutes might be a slight exaggeration – but only a very slight one. Grouse markets itself as an all-season mountain and there certainly seems to be a lot to do up there all year round – and the 1.2 million annual visitors per year is testament to that. But this site is about snowboarding so that’s what we’ll focus on here. For more seasoned free-riders this mountain may lose its appeal fairly quickly. With less acreage to explore, the proximity of the mountain may be outweighed by the lack of advanced and expert runs to keep you interested. On the other hand if you are just starting out or in that intermediate phase this may be a better option for you – at least for a season – and you could save yourself at least 20 minutes of time in the car (time that could be spent shredding the slopes!). The green run ‘The Cut’ looks like a good long beginners run for those starting out to be able get some good rhythm going. The verdict for the downhill runs – if you’re a seasoned advanced or expert rider then the extra time spent to get to Cypress or Seymour is probably worth the effort – though that shouldn’t stop you from exploring grouse for a day or two. I just wouldn’t recommend a season pass. If you are a beginner then this is probably your best bet. You won’t be able to take advantage of the extra terrain that the other mountains offer just yet so why not save yourself the travel time. There are two terrain parks though kind of 3 if you count “The Cut Line” which comes in on the left of the main beginners run (The Cut) – see Trail Map below. This can be used as a variation of going down the Quicksilver Park as you can rejoin the Quicksilver once you’ve gone through the Cut Line. The other park, Paradise Jib Park, is to the right of The Cut and has smaller features for those still learning their way in the free-style world (sounds like my kind of place!). Click the image below for Grouse’s Trail Map in PDF format. Let me know in the comments section below if this link isn’t working (in case Grouse have put an updated one up for the new season that I wasn’t aware of). If you’re a knight-rider then you’ll pleased to know that Grouse has 14 trails lit up for night riding and it’s open until 10pm! A full day pass is valid for…the full day! That is 9am to 10pm. Not too much more than a night pass so pretty good value. Of course there are also season passes and Grouse also offers a season night pass and a 1 night per week pass. Check out their ticket page for more details. They usually open mid to late November. With extensive snowmaking facilities this date has been pretty consistent over the last 5 years. Grouse usually closes at the end of April. But as you will see below that season is often extended through may and sometimes even June! – though often only on the weekends in those later months. But still that is a pretty late season. Late season hours are usually reduced and varied and decided on at the time. Peak Season hours are 9am to 10pm weekdays and 8:30am – 10pm weekends. All of these hours are weather permitting of course. It begs repeating that the Grouse Ski Resort is only 20mins (or even 15 possibly) from downtown Vancouver by car. You can also reach it by public transport! – making this one of the most accessible snowboarding mountains in the world. When you get to the base you will need to take the sky-ride up. The cost of this is included with your lift pass or season pass. By car: Follow West Georgia street through Stanley park and go over lions gate bridge and keep following that road until you get to Marine Drive. Take the Marine Drive exit and then turn left onto Capilano Road and keep following that up until you get there. Capilano Road will turn into Nancy Green Way. For GPS directions use 6400 Nancy Greene Way, North Vancouver or Click here for GPS directions. Public Transport: The 232 bus goes to Grouse Mountain! This is public transport – how cool is that! And cheap. You’ll need to find your way to where the 232 starts which will depend on where you’re coming from. From downtown you can take the 246 which leaves from Hamilton St at West Georgia St. Get off at the Edgemont Blvd At Ridgewood Dr stop and transfer to the 232. Check out Translink and Google Maps for more details. Other options are using the 240 and 236 buses or the 246 to 236. Rideshare: As always there is the option of ride-share. 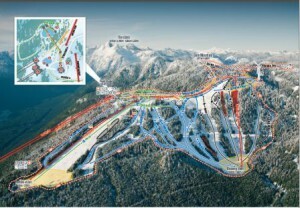 Check out http://www.hitchwhistler.com or http://www.theskilift.org. This is a great option especially if you want to meet fellow riders on your way up – or you may even share a ride with a skier – heaven forbid! With the ease of public transport this option may not be as good as it is with the likes of Cypress and Seymour but it is still a good, cheap option. So What’s Your Experience with Snowboarding on Grouse? Always curious to know what others think of the different resorts. What’s your experience with Grouse snowboarding? And how it compares to its neighbours? Any other comments, questions or feedback also welcome. I love Vancouver, it’s got everything. Thanks for the maps and detailed info. Thanks for the comments Mary – Vancouver’s rocks! Hey Nate, this is great stuff. Thanks for the detailed info. I’m thinking of doing a snow trip to Canada sometime soon hopefully! What is the best time of the season to go, would it be right in the middle of the season? Do the mountains in this area use snow machines as well or is it all-natural? Also I was wondering what kind of hire options (and prices) for snowboard gear are nearby? Hey Jolie. You should definitely come for a snow trip! Best time of season is any time there is snow 🙂 – in all seriousness though probably January to March for best snow conditions but this can vary. If you want to avoid the crowds then outside of holidays is a good bet. Or if you want the crowds and the party atmosphere then holidays are the best times to go. Grouse, Cypress and Whistler/Blackcomb use snow making machines but Seymour is all natural. Seymour chose to upgrade one of their lifts recently instead of bringing in snow-making so I imagine next time they make a capital investment it will be for snow-making – but if you go in the peak season then whether there is snow-making or not shouldn’t make any difference. Thanks, I will check those out! I know where I live to do a snow trip will cost you a heap of money just in park/lift fees and hire gear. It is actually cheaper sometimes to do it overseas, and that’s including plane flights (crazy I know!). Appreciate the info. Hey – yeah it’s crazy how that works sometimes. Always fun to do an overseas mission too. Hope you have a great season and thanks for the comments!